The Alarm goes off and we’re ready to go on a field trip. We get picked up by bus at 05:00, so there is no rest for the wicked. We pack or bag and bring water for the day and a jacket in case it’s cold on the bus. Brilliant planning. The reception gives us breakfast bags when we go downstairs and soon after that the bus arrives. We’re the last hotel apparently so we go straight towards the temple ruins in My Son. Katja and Mette dorms while I pick up my iPad. When the lights comes back on in the bus wet eat our breakfast and see the world outside come to life. It’s green here. Like ‘jungle in the movies’-green. And it get more so from the raindrops hanging from all the leaves. Yay, rain. We did not bring our rain jackets, nor the umbrella from the room. Pretty good job by “supreme grandmaster of blue skies and sunshine”. As we leave the bus it really rain. Not like monsoon in Asia- rain, but still. I take off the jacket and put it in the backpack. Katja takes her (beautiful, remember?) scarf and do the same. This way well at least have something dry later on when we head back. We get a good guided tour of My Son and see buildings that have been around for more than thousand years. It saddens me to learn of the American bombings of this place during the war. There are a couple of bombs on display that didn’t go off, and there are craters where you can see the enormous power in the bombs dropped. War is hell, for people and the surroundings. Can’t we just all get along? Only one showed any kind of preparation for the weather. Among other things we learn today we’re the holy animals of the old people: Lion, Elephant, Dragon and Snake. The snakes depicted here were two headed, but further south you’ll find the nine headed snakes. This correlates to the rivers. Here it’s two larger waterways, down in the Mekong delta there are nine. The old people did not use mortar when building the temples. They used bricks and sap from an ancient tree to build it instead. When you look at the old stones today they look amazingly good. The guide explained this with the amount of air inside each brick that lets the water out quickly after it rains. There were examples of bricks less than a hundred years old covered in moss while the thousand year old looked amazingly fresh. After about one hour and countless number of times Mette gets it when the guide says:”vesto”, that he actually means “restore”. Good thing she did, because it helped me a lot also. After the tour of the place we got out of the wet t-shirts and took on the dry jackets. That felt good. We got information that we could ride a boat down to Hoi An, and we wanted to do that. It turned out that the boat ride was just for the last forty minutes of the tour, and we had in advance asked about the boat. Does it have a roof? When we got that confirmed we agreed on taking the boat, but it was in a class or two below our expectations anyway. The rain had stopped so we did have a nice run down the river back to town. It was only five of us, out of the eighteen, that went on the boat. Good thing as it only had five seats. And then we suddenly stopped by a village along the river. A wood carving village that held little of interest really. We walked through it and looked at the carvings, but they are very dramatic and large, and in very dark wood. We did get us some (20) new bamboo chop sticks for a couple of dollars. On the way back to the boat it started raining again and it was a bit wet on the way across the river. 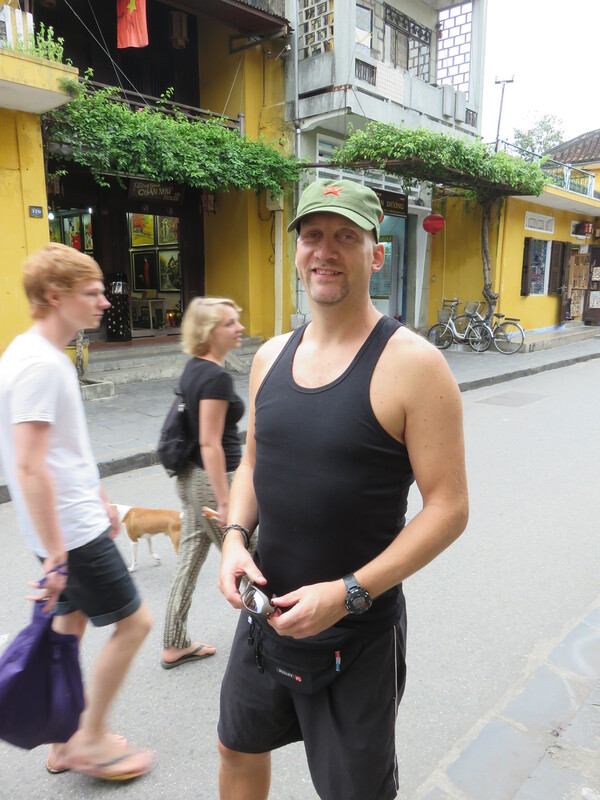 We walked from Hoi An center back to the hotel. We got us a nice cup of coffee the best one since crossing over the boarder. We also tried to pick up the laundry, but “pis, no ledy. O mo ou? ” read it out loud if you can’t understand it. Finally back at the hotel I filled the tub and lay there for an hour getting my mojo back. Katja chose another option and went for an hour of massage. Right now we’re sitting at the lunch place at 13:30 and are awaiting our food. It feels like it should be dinner time already. Getting up this early messes with my time/space continuum. One again we’re not overly lucky with a choice of restaurant. It’s mediocre food and we leave add soon as it’s eaten. We are going to get me a haircut, Mette we’ll pick up something from her tailor, and Katja will try on the dress she got in production. I say bye bye to the girls and find a barber. First he did the hair as supposed, then the beard and I thought we closed in on the end, but no. He put shaving cream on my sideburns and neck and brought out the shaving knife. Without warning he flicked a switch and I fell backwards with the chair and got a shave also. Nice. Now finished? Nope. While laying down in the chair he takes out a bunch of metal sticks, much like any torturer in a Hollywood production. I dared not move at all since my ear suddenly was filled with sharp instruments. He took out on a head light and was scraping the ear tunnel. “Find much?”, I asked jokingly when he moved to the other side. “Yes!”, was the brutally honest answer. Now finished? Nope! Now it was time for a head massage. Not the fingertip one you might expect, but a rather heavy machinery that looked like the top end of a jackhammer. He ruled it over my entire head, down the neck and pushed me up to get access to my back. Pooh, Ok, now finished! The fact that my eyebrows was unmolested passed in silence as I now was ready to leave. As all this took place there were several people walking by in the street (there are no wall out towards the road) and they stopped to take picture of the spectacle. I escaped without a scratch and could walk down to Katja and Mette and join them at a coffee place. Who is that? It’s Mr. Handsome! We have bought ticket for entering some of the oldest houses in Hoi An. It’s a ticket that gives us an opportunity to see the inside of some of the older ways of living. We enter the first one and was utterly disappointed. Nothing really to see and not informative in any way. We did buy a few small ceramic pieces for soya sauce and wazabi when having Sushi. They will go well with our newly acquired chop sticks. The next one was way better. It was the house if one of Hoi An’s leading figures in the communist party and thereby a key figure in the resistance. He got to be a 102 years old and passed away just six years ago. The house kept a lot of memorabilia and I learned a lot walking around looking and reading. Quite cool. I got myself one of the traditional caps in military green and the red star in front today. Walking in the evening an old, and I mean old, man address me and say:”Nice cap. Nice cap. Vely nice cap.” He’s old enough to have seen, and maybe been part of, the war. The symbol is far from my political views, but it’s a nice tribute to the struggle the country has been through to get to where they are today. Katja is getting a tailored dress, but as anyone can imagine the trying and alterations takes their time. Hopefully it’ll be nice. You should go back to your tailor and demand the money back! We had set a meet with Mette down by the pool to finalize the plan for the days ahead. We all brought iPad and sat surfing on hotels, things to do, weather forecasts and so forth. We changed the plan yet again and are now staying another night in Hoi An before spending a day in Da Nang. Then we’ll take the night train to Hanoi and spend the rest of the days there before we go to Cambodia next Saturday. We got hotels booked and are set for everything except train tickets. We’ll get those tomorrow. Next off to dinner. We ended on a restaurant, in the really busy tourist area by the river, that served ok food, but really no more than that. Back in bed we set the alarm an hour earlier than first decided as we’ll go for a walk before breakfast. Back of from my food! Categories: Vietnam | Tags: Culture, Hoi An, Vietnam | Permalink.